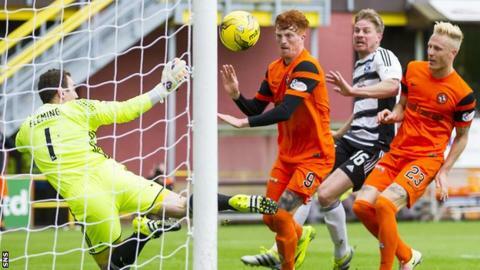 Dundee United claimed their first Championship win at the third attempt as they brushed aside Ayr at Tannadice. Simon Murray, Jamie Robson and Willo Flood all scored as the hosts brought their League Cup form into the league. After Cammy Smith was fouled, Nick van der Velden's penalty was saved by Greg Fleming but Murray was the quickest to react and headed in from close range. Robson turned in Flood's low delivery before Flood sealed the points when he converted Tope Obadeyi's cross. It was the midfielder's first goal since returning to the club for a fourth time last month, and helped lift United to fourth place, five points behind leaders Raith Rovers and Hibernian. The Tangerines began the game in whirlwind fashion with Van der Velden, Scott Fraser, Murray and Coll Donaldson all going close in the opening 10 minutes. The visitors' defence was under severe pressure and was eventually breached after 13 minutes. Smith was pulled down inside the box by Paddy Boyle and, although Dutch midfielder Van der Velden's spot-kick was saved, Murray reacted swiftly to nod the ball in. Ayr's former Dundee midfielder Gary Harkins warmed the palms of Cammy Bell with a thunderous 25-yard shot but United scored their second eight minutes before the break. Van der Velden cut the ball back from the bye-line and, although the Ayr defence cleared the initial cross, Robson pounced to blast the ball beyond Fleming. It was the 18-year-old's first ever goal for the club as he continues to repay the faith shown in him by manager Ray McKinnon. Ayr introduced Jamie Thoms and Brian Gilmour for the second half and the visitors did improve but failed to test Bell in the home goal. The home side, urged on by a crowd of 6,427, looked a little uneasy in the second period until McKinnon brought on Obedeyi and Blair Spittal with 15 minutes left, producing an immediate impact. Obedeyi did well to Flood inside the six-yard box and the midfielder found the back of the net with ease as United strolled to victory. "If you had said to me before the game we would have a 3-0 win I would have been happy with that. "We had a really good first half so I'm very pleased with that. The second half we have to give credit to Ayr United who came back into the game and made it difficult for us. "There is no divine right to win games in this league. Everybody has quality in their teams and you have to be at it for 90 minutes." "I don't think it was a fair reflection on the game. We had a couple of really good opportunities in the first half but I would not begrudge Dundee United their 2-0 lead. "I thought we were the dominant team for most of the second half and had numerous opportunities to work the keeper but didn't. "Some of the players are still finding their feet. They were a lot better today but they just need to find their belief at these places and just play." Match ends, Dundee United 3, Ayr United 0. Second Half ends, Dundee United 3, Ayr United 0. Attempt missed. Gary Harkins (Ayr United) right footed shot from outside the box is close, but misses to the right. Attempt saved. Blair Spittal (Dundee United) right footed shot from long range on the right is saved in the centre of the goal. Attempt saved. Gary Harkins (Ayr United) right footed shot from the right side of the box is saved in the centre of the goal. Foul by Charlie Telfer (Dundee United). Gary Harkins (Ayr United) wins a free kick in the defensive half. Attempt missed. Craig McGuffie (Ayr United) left footed shot from outside the box is close, but misses to the right. Attempt missed. Patrick Boyle (Ayr United) right footed shot from a difficult angle on the left is close, but misses to the left. Foul by Lewis Toshney (Dundee United). Blair Spittal (Dundee United) wins a free kick in the defensive half. Foul by Patrick Boyle (Ayr United). Substitution, Dundee United. Charlie Telfer replaces Willo Flood. Attempt missed. Gary Harkins (Ayr United) header from the centre of the box is close, but misses to the left. Corner, Ayr United. Conceded by Sean Dillon. Foul by Stewart Murdoch (Dundee United). Craig McGuffie (Ayr United) wins a free kick in the attacking half. Substitution, Ayr United. Craig McGuffie replaces Kevin Nisbet. Goal! Dundee United 3, Ayr United 0. Willo Flood (Dundee United) right footed shot from very close range to the centre of the goal. Attempt missed. Brian Gilmour (Ayr United) right footed shot from outside the box is close, but misses to the right. Simon Murray (Dundee United) is shown the yellow card for a bad foul. Foul by Simon Murray (Dundee United). Corner, Ayr United. Conceded by Jamie Robson. Scott Fraser (Dundee United) wins a free kick in the attacking half. Attempt saved. Cameron Smith (Dundee United) right footed shot from outside the box is saved in the bottom left corner. Attempt missed. Kevin Nisbet (Ayr United) right footed shot from a difficult angle on the left is close, but misses to the left. Scott Fraser (Dundee United) wins a free kick on the left wing. Substitution, Dundee United. Blair Spittal replaces Scott Fraser. Substitution, Dundee United. Tope Obadeyi replaces Cameron Smith. Attempt missed. Gary Harkins (Ayr United) right footed shot from outside the box is just a bit too high. Attempt missed. Jamie Thomas (Ayr United) right footed shot from the centre of the box is close, but misses the top left corner. Foul by Cameron Smith (Dundee United). Ross Docherty (Ayr United) wins a free kick on the left wing. Scott Fraser (Dundee United) wins a free kick in the defensive half.